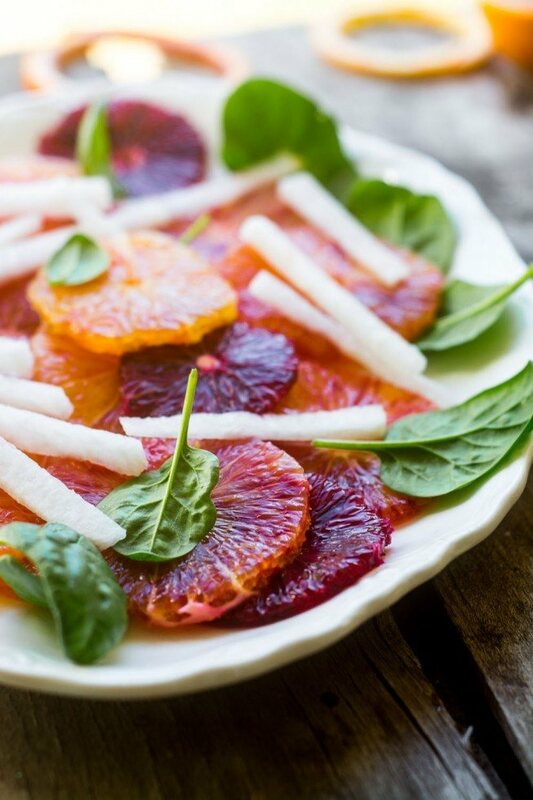 Blood Orange and Jicama Salad is a refreshing mix of juicy citrus and crunchy jicama --- it's beautiful, delicious and full of Vitamin C! Slice the oranges into 1/8 - 1/4 inch slices. Trim the rind with a small sharp knife or scissors. Remove any seeds. Peel the jicama and slice itinto 1/4 inch slices. Cut the slices into thin matchsticks. Arrange the slices of orange on a platter along with the spinach leaves. Scatter the jicama sticks on top, and season with salt and pepper. Just before serving, drizzle with the vinegar.